New: The State Department and religious freedom – A new beginning? New: Diapers for Refugees program continues in Iraq. What about Syria? Religious Freedom Summit in Washington, D.C. Ambassador Sam Brownback brings real change: It is not the “same old, same old” at the State Department regarding religious freedom. The week of July 23rd, a three-day “Ministerial to Advance Religious Freedom” was held in Washington, D.C. The term “ministerial” was used because ranking government officials from other nations participated. 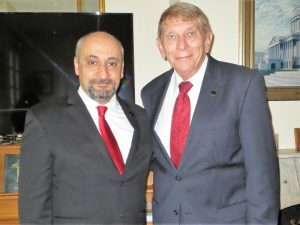 Sargis Sangari, the head of the Near East Center for Strategic Engagement and William J. Murray. Actress Roma Downey and Mark Burnett, who produced the TV series The Bible and have a current show called A.D. The Bible Continues, were interviewed by Voice of America during the week. Not all events were held at the State Department. There were numerous participating events at various places including Capitol Hill and at offices of private organizations. I participated with Ambassador Brownback at the very first event, one that preceded his opening remarks. Representatives of the Religious Freedom Coalition and other organizations met for a prayer breakfast with Ambassador Brownback on Tuesday, July 24th before he officially opened the series of events for religious freedom. The prayer breakfast was held at Faith and Action’s townhouse on 2nd Street, which has a Ten Commandments plaque in the front yard and is located directly across from the Supreme Court. Sam Brownback participated in the prayers as we prayed for the success of the meetings and that seeds would be planted in the hearts of the leaders of nations where religious freedom is lacking — such as Muslim nations in the Middle East and those under the sway of single-party governments such as China. One of those participating in the events concerning the Middle East was Sargis Sangari, an important figure among Assyrian Christians. He works tirelessly on Capitol Hill to bring awareness to America about the plight of Assyrian Christians in Iraq and Syria. Secretary Pompeo and religious freedom: Secretary of State Mike Pompeo, who was previously the head of the CIA, took full credit for the Ministerial to Advance Religious Freedom. I found this interesting because of his outspoken support for nations such as Saudi Arabia, which has zero religious freedom. In his official State Department Statement, Secretary Pompeo is listed as the “host” who called for the gathering. During the three-day event, there were meetings I could attend and some I could not. Several overlapped or were held at the same time. Other meetings were scheduled for Members of Congress only. Secretary Pompeo’s hand was evident in some of the meetings that were anti-China and anti-Russia. One meeting was called “Russia: Religious Freedom in Peril” and concerned the outlawing there of the Church of Scientology, which is a destructive cult centered around Hollywood celebrities. It is classified as a cult in Russia and banned. There was a meeting to discuss religious persecution in Iran — but not in Saudi Arabia. This is interesting because there are Christian churches in Iran with about 370,000 members in total. That number is among established churches such as the Armenian Apostolic Church. There are probably many more converts in house churches that are considered illegal. While some persecution does exist, seats are actually reserved in the Iranian parliament for Christians and Jews. In Saudi Arabia, on the other hand, there are no churches allowed at all and even foreign workers found to be praying in groups have been arrested! However, there were no meetings during the week concerning Saudi Arabia that I know of. Syrian Opportunity? Mr. Sangari’s organization, which I mentioned above, works with Assyrian Christians inside of both Iraq and Syria and may be able to help introduce programs such as Christmas for Refugees in Syria once the civil war is over. Thousands of Syrians are moving back to Syria each week from Lebanon and a good percentage of them are Christians. For the most part Syrian civilians fled the areas controlled by the Sunni Muslim rebels that America and Saudi Arabia supported. Even Sunni Muslims fled, as they did not want to live under the strict Islamic rules required by many of the Free Syrian Army groups. There never was one “Free Syrian Army.” The “Free Syrian Army” was made up of literally hundreds of small, armed Sunni Muslim bands. At one point, the United States was supplying heavy weapons, including anti-tank missiles, to over forty of these armed groups, including the Martyrs of Islam, the Sword of al-Sham, Dawn of Islam, and the Knights of Golan. Aleppo is a good example of those returning. The 20% or so of Aleppo held by Free Syrian Army factions and al-Qaeda had virtually no civilians other than those used as human shields, who were not allowed to leave. As eastern Aleppo is rebuilt by the Syrian government, thousands of civilians are moving back. Most of those leaving Lebanon are going to Aleppo. Those Syrian civilians returning to areas liberated by the Syrian Army are finding that their homes were looted by the Sunni Muslim rebel groups. Many homes were destroyed in the fighting, as well. Christians returning home in Syria have the same needs as those who returned in Iraq. There is no electric power or drinkable water as yet in many areas. The United States and Sunni Gulf States such as Saudi Arabia supplied billions of dollars in arms to Sunni rebel groups and paid the salaries of fighters. Now the United States and Saudi Arabia are vowing to block any official aid through the United Nations to rebuild Syria. There probably can be no expansion of the Diaper or Christmas programs into Syria this year, but when communications improve as the civil war winds down a serious look will be taken at opportunities to help Christian families. Our Christian brothers and sisters in Syria need our prayers, please pray for them! Not forgetting China: There are tens of millions of Christians in China who are members of registered churches. For the most part, the Chinese communist government leaves them alone as long as they buy and distribute only the “Patriotic Bible” which is printed by the government. Shipping non-approved Bibles into China, or printing them, is illegal. Bibles can only be purchased in church stores in China. Amazon and other online sellers are prohibited from selling electronic versions. The text of the Bible is not altered, but does contain many added pages in the front “explaining” why Christians must be patriotic and accept the rule of the Communist Party. 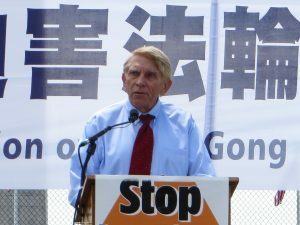 William J. Murray speaks at an event at the Washington Monument in Washington promoting religious freedom in China. Currently, the Communist Party under President Xi is promoting “traditional” Chinese religions which include Buddhism and Taoism, while once again trying to discourage Christian belief. In the early 1990’s, the Chinese government promoted Falun Gong just as it does Taoism now, but realized a problem when tens of millions joined. It was made illegal in 1994. There are numerous rallies in Washington to promote religious freedom in China, including those by the Falun Gong. Let us not make a mistake here: the Falun Gong is a cult and in no way reflects Christian beliefs. But the Falun Gong does a good job of calling to the attention of Americans that the situation in China is not all a bed of soft tea leaf flowers when it comes to religious freedom. On occasion, I will join congressmen and others to speak at rallies held in Washington, D.C. that call for more religious freedom in China including an end to the extreme persecution of the Falun Gong members. These people have undergone forced abortions and the removal of human organs from living “donors” to sell in the Chinese medical system to Westerners at a staggering price. Someone needing a kidney can normally obtain one within two weeks of arriving in China versus waiting for many years in the United States. This is because of forced “donations” from prisoners. On July 19th, I was one of the major speakers at an outdoor event at the Washington Monument. I spoke about the pressure placed on Christian churches having increased under President Xi. Under Xi, the persecution of Christian “house churches” and of the Falun Gong has increased. As a Christian, I certainly do not agree with the theology of the Falun Gong, but the extreme persecution of their group is wrong. Furthermore, it helps to mask the persecution of various Christian churches, including control over the Catholic Church. The Chinese government has gone so far as to appoint bishops inside the Catholic Church against the wishes of the Pope. The focus of the Religious Freedom Coalition currently is dealing with the Sunni Muslim threat to Christians in the Middle East and Africa – as well as within our own nation. We cannot completely ignore, however, the continuing threat from the Chinese Communist Party. Congress and the Middle East: The Religious Freedom Coalition continues to battle on Capitol Hill for the original language of HR-390, the Iraq and Syria Genocide Emergency Relief and Accountability Act of 2017. That language was passed overwhelmingly by the House and would have given real hope to Christians in the Middle East. THEN … Senator Corker (R-TN) got his hands on the bill and added language that changed its purpose to the formation of endless “commissions and study groups” all with the aim of blaming the Syrian government, Russia, and Iran for the seven-year-long civil war — which was started by and funded by the Sunni Muslim nation of Saudi Arabia. As just one example of Senator Corker’s detrimental changes, Syrian Christian citizens who were drafted into the Syrian Army and who fought on the front lines against al-Qaeda and the Islamic State (ISIS), would be labeled war criminals! This is not acceptable. Many Religious Freedom Coalition supporters who have written to their congressmen and senators demanding the original language of HR-390 have sent me the responses they have received. What shocks me most is that most congressmen and senators do not know that the original language has been changed. A recent reply letter by GOP Senator Joni Ernst wrote that the bill was passed in the House and referred to the Senate, but never mentioned amendments or actions since. Many of the responses from congressmen and senators are similar, but still we are making some headway, as senators I have talked with are blocking the bill until it is fixed. Expansion or contraction: The question for the Christmas program in 2018 comes down to this: Will the program increase or decrease in size? As Christians have moved from IDP camps back to their looted and often destroyed homes, the Christmas programs are still very-much needed, but are more expensive to provide. In Iraq, rather than holding the programs in a few IDP camps concentrated around the city of Erbil, we must now take the program into villages in the Nineveh Plain. This will increase the cost. Matching program coming: Currently a matching gift program to double gifts to Christmas for Refugees is being established, but agreement on a total has not been reached by the generous supporters setting it up. As soon as the amount of the trust fund for the matching gifts for Christmas for Refugees is set, I will send you a special letter on how to participate. Diapers for Refugees: The Diapers for Refugees program still has two major deliveries for 2018 — one in September and one in December. Each diaper purchase will cost $35,000 and each one will fill the needs of at least 2,000 babies and toddlers for three months. Over half a million diapers will be purchased just in September, plus sanitary pads for women, and diapers for special needs adults. This is a program not duplicated by any other ministry in Iraq. Please keep the Christian families and their children that we help with these programs in your prayers. Many have lost not only their material belongings, but loved ones as well.